A while ago at the Wattle Grove “Quilting Sit and Sew Group” one of the ladies – Robyn – was telling us about her niece, Angel James of Port Macquarie. What an inspiring young women she is! On April 10th 2009, when she was only 19 years old, a blood clot lodged in the anterior column of her spinal cord leaving her an “incomplete quadriplegic”. Prior to this tragic occurrence she was an independent young woman with a promising theatrical career ahead of her. Suddenly, far from being independent she was dependent on others in ways she never dreamed of. Her life may have been turned upside down but she decided to fight against the limitations that had imposed themselves upon her. She spent two months in hospital where intensive therapy coupled with Angel’s determination saw her condition improve to the point where even though she is completely paralysed down her right side and partially paralysed down her left, she could walk. What an amazing achievement! What’s more she recently took part in the Sydney Running Festival to raise funds for the charity, Spinal Cord Injuries Australia, and the Walk On program. Here’s a video where Angel tells you all about it. After leaving hospital she needed rehab but this was extremely expensive. Somewhere in the region of $2000 per month. However, Angel’s aunty told the quilting group that if Angel can buy the gym equipment she needs then she can complete her rehab at home. It turns out that children and the aged have access to support that isn’t available to people in their teens and twenties. Sheer determination is what motivates Angel to get out of bed every morning and into the gym to maintain her physical and mental strength. This coupled with the love and support of her friends and family is what keeps her going. When Angel’s Aunty Robyn told us Angel’s story immediately one of the quilters suggested we make a quilt to raffle for her to help Angel with her ongoing expenses with her rehabilitation. 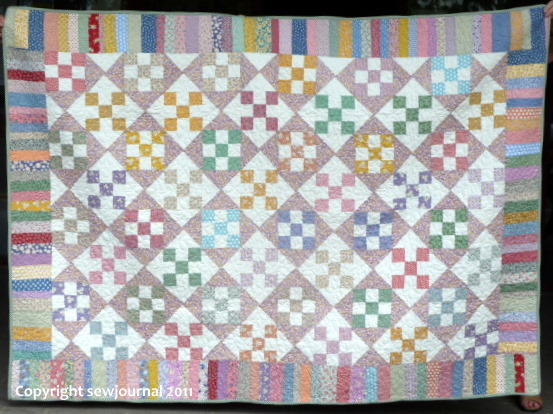 We all agreed until one of the quilters – Anne Cunningham – generously offered a beautiful 1930s repro quilt she had made. The rest of us then offered to donate money to pay for the quilting of the quilt. Robyn made enquiries in Port Macquarie and it looked like the local Rotary Club would raffle the quilt for her. For various reasons this fell through and we had to decide how to use this beautiful quilt to help Angel. That’s when the Sewjournal Blog Auction idea came up. 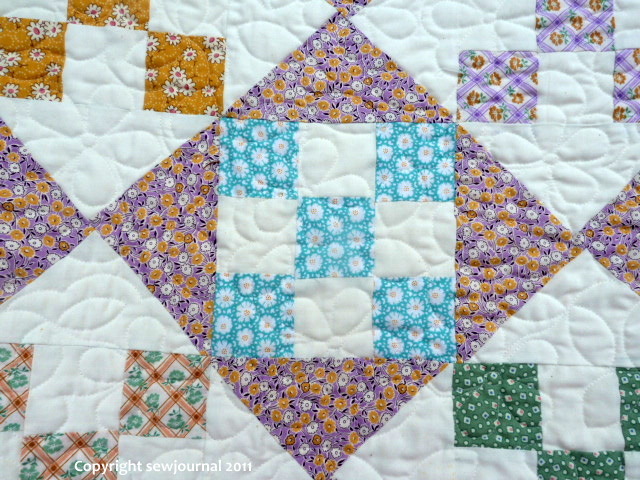 Here are some photos of the quilt. 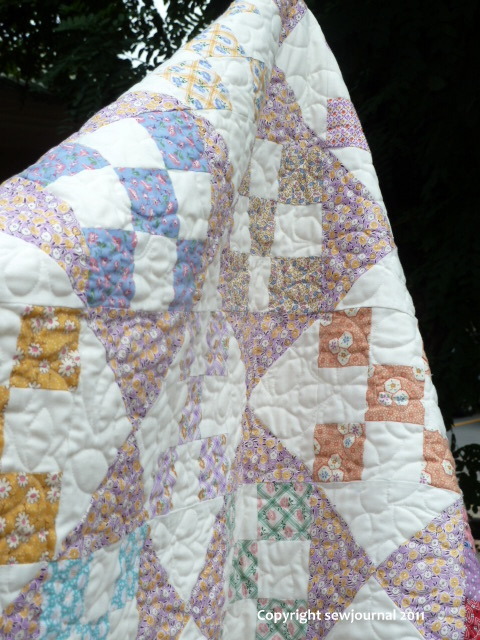 The quilt is made from 1930s reproduction fabrics and machine quilted. It is 80”x 58” or 203cm x 148cm. I have set up a special page for bidding just as I did with the Flood Appeal Auction. If you would like to bid just add a comment to that page saying how much you bid. Here is the link to the page. We have put a reserve on the quilt and as bidding on it progresses I will let you know when the reserve has been met and the quilt is “on the market” so-to-speak. The winning bidder will have to pay postage & insurance but if you contact me I can let you know how much this will be to your location. Once bidding has finished on March 15th I will put the winner in contact with Angel’s Aunty Robyn who can give you Angel’s bank deposit details and who will take your details so she can send you the quilt. Quilters are always so generous with their time, money and skills and I hope you will join this auction so we can really make a difference in Angel’s life.